WASHINGTON — President Obama on Wednesday announced his intent to nominate Caroline Kennedy as U.S. ambassador to Japan. Kennedy, 55, is the daughter of the late President John F. Kennedy and his wife, Jacqueline. If confirmed, she would succeed Ambassador John Roos, a former Silicon Valley lawyer, and become America’s first female envoy to Japan. 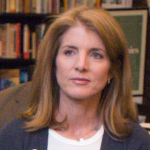 Caroline Kennedy is president of the John F. Kennedy Library Foundation and chair of the Senior Advisory Committee of the Institute of Politics at Harvard University. In September 2012, she was appointed as a general trustee of the Board of Trustees of the John F. Kennedy Center for the Performing Arts. From 2002 to 2012, she served as vice chair of the Fund for Public Schools in New York City. She is also on the board of New Visions for Public Schools and serves as honorary chair of the American Ballet Theater. From 1998 to 2009, she served on the board of the NAACP Legal Defense and Educational Fund. From 1994 to 2011, Kennedy served on the board of the Commission on Presidential Debates. She is the editor of several New York Times best-selling books on topics including constitutional law, American history, politics, and poetry. She received a B.A. from Harvard University and a J.D. from Columbia Law School. He did not specifically comment on Kennedy’s qualifications. “The Government of Japan welcomes the nomination of Ms. Caroline Kennedy as new U.S. ambassador to Japan. “The GOJ understands that Ms. Caroline Kennedy has the deep confidence of President Obama, and it highly appreciates her nomination as reflecting the great importance the Obama Administration attaches to the Japan-U.S. alliance. Kennedy comes from a prominent political family. In addition to her father, who was assassinated in 1963, she is the niece of Sen. Robert Kennedy, who was assassinated in 1968 while running for president, and Sen. Ted Kennedy, who served in the Senate from 1962 until his death in 2009. Her grandfather, Joseph Kennedy Sr., was President Franklin Roosevelt’s ambassador to Britain, and one of her aunts, Jean Kennedy Smith, was President Bill Clinton’s ambassador to Ireland. Previous U.S. ambassadors to Japan have included former Vice President Walter Mondale, former House Speaker Tom Foley, and former Senate Majority Leaders Mike Mansfield and Howard Baker.